This article is about Dark Samus's appearance in Super Smash Bros. Ultimate. For the character in other contexts, see Dark Samus. Dark Samus (ダークサムス, Dark Samus) is a playable character in Super Smash Bros. Ultimate. She was announced as a newcomer during the August 8th, 2018 Super Smash Bros. Direct, alongside Chrom. She is an Echo Fighter of Samus, thus being classified as fighter #04ε. Play VS. matches, with Dark Samus being the 50th character to be unlocked. Clear Classic Mode with Samus or any character in her unlock tree, being the fifth character unlocked after Incineroar. Have Dark Samus join the player's party in World of Light. With the exception of the third method, Dark Samus must then be defeated on Frigate Orpheon. As with certain other Echo Fighters, Dark Samus is nearly identical gameplay-wise to Samus, with largely aesthetic differences. However, she has many basic animations that are different from Samus, a more standard roll which does not involve turning into a Morph Ball, electric effects instead of fire effects for most of Samus's fire-based moves, and different models for both the Morph Ball and Missile. However, Dark Samus's small advantages over Samus (such as a slightly faster roll, or her up smash hitting grounded smaller characters more easily) are considered to be less situational than Samus's small advantages over Dark Samus (such as the ability to detonate enemy bombs with her flame properties, more range on her forward smash, or a smaller hurtbox after rolling). As such, Dark Samus is commonly agreed to be a straight upgrade from Samus, though the gameplay differences are so marginal that it is ultimately up to preference over which character to choose from. As with all other Echo Fighters, Dark Samus has different taunts and victory animations. Dark Samus has a different victory theme, shared with Ridley. Dark Samus's on-screen appearance has her warp onto the stage from a dark portal. Dark Samus has many animations that are different from Samus, which extends to her idle, walking, dashing, double jumping, perfect shield, and dodge animations. Additionally, these animations visually appear floatier than Samus's equivalents. Many of Samus's two-handed animations are one-handed for Dark Samus, such as with Charge Shot and Missile. Dark Samus's arm cannon splits apart and grows Phazon tendrils for some moves, such as her grab, Missiles, forward smash, and Final Smash. Dark Samus's Arm Cannon-based attacks like down tilt, up smash and forward aerial use dark and neon blue clouds instead of orange explosions. Samus's moves that possess flame effects (except for Missile and Bomb) have been changed into electric effects for Dark Samus. This changes how their respective moves interact with others, such as Dark Samus being unable to detonate other characters' bombs with her equivalent moves, and being able to hurt Olimar's Red Pikmin with them but not his Yellow Pikmin. Dark Samus's shield size is slightly larger than Samus's (11 → 11.7), due to her shielding animation being different as she assumes a more upright stance. Both of Dark Samus's rolls have less ending lag than Samus's (FAF 35 → 32 (forward), 40 → 37 (back)). However, Dark Samus is more vulnerable during ending lag due to her larger hurtboxes when rolling. 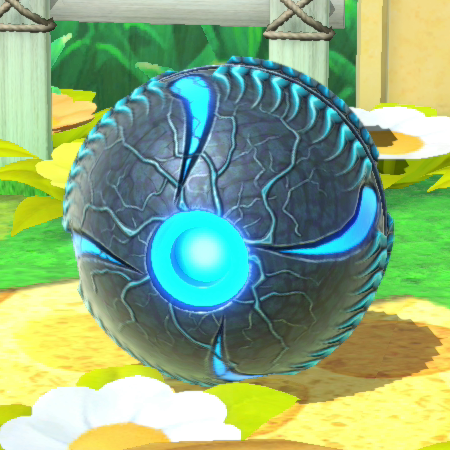 Dark Samus doesn't transform into the Morph Ball when rolling or spin while jumping. Dark Samus's dash attack has an altered animation where Dark Samus hovers in midair, and features a white aura around her that is absent on Samus. Additionally, Dark Samus does not use her jet boosters during the animation. All of Dark Samus's smash attacks have altered animations. Dark Samus's forward smash has slightly less range. Dark Samus's up smash can catch opponents at a lower height. Missiles and Bomb have an organic appearance. Charge Shot is mostly black and dark blue, with tendrils extending from the edges. Dark Samus fires her Charge Shot and Missiles at a slightly lower elevation. This allows Charge Shot to hit low profiling opponents more easily, such as a crouching Pichu or Pikachu hanging from the ledge. However, this makes it slightly easier for opponents to jump over her projectiles. It is mostly black and dark blue, as opposed to white and light blue. Phazon Laser lacks the thruster hitboxes of Samus's equivalent Final Smash. Missile has more range and less endlag. Charge Shot deals less shield damage. Dark Samus can wall jump. Dark Samus possesses a tether attack and grab. Straight and Cannon Hammer 3% A left-handed jab followed by a forearm club with the Arm Cannon. Despite dealing above-average damage for a neutral attack, it is poor overall, as opponents can usually act out before the second hit connects by shielding or using a fast attack, while the second hit may not even connect at high percentages. Depending on the opponent's weight, it is safe and a true combo at high percents, but only if the first hit connects relatively close to the arm and not at the fist. The second hit does have KO potential at very high percentages, however. 11% (foot), 10% (leg), 9% (body) A reverse roundhouse kick. Deals more damage and knockback at her foot, while her leg deals less damage and knockback. Can be angled, which causes it to deal more damage, but may cause it to miss shorter characters on the ground if angled up. The foot sweetspot deals rather potent knockback for a tilt attack, which can KO at the edge at around 125%. At varying percentages, depending on which part of the move is landed, it can lead into a guaranteed Charge Shot, as regardless of teching, Charge Shot can catch the opponent's option in time if they are knocked down. 13% (grounded), 12% (aerial) An axe kick resembling Captain Falcon's up tilt. It behaves unusually as it meteor smashes grounded opponents, but launches aerial opponents at a horizontal angle. This allows it to set up combos against the former at a wide range of percents, while still being a reliable edgeguard tool, due to its wide coverage and powerful enough knockback to KO aerial opponents at around 95% at the edge. At high percents, the grounded meteor can also set up KO confirms into a fully charged Charge Shot. However, the move has noticeable startup, due to coming out on frame 15, making it Dark Samus's slowest normal attack on the ground. 12% Kneels and quickly thrusts her Arm Cannon downward to fire a small, electric blast. It is very fast, due to coming out on frame 6, and deals respectable damage and knockback for a tilt attack, KOing at around 160% off the top blast line. It is useful as a close range anti-pressure option on opponents in front of Dark Samus, or as a punishment option. However, its very high ending lag leaves it easy to punish if shielded of missed. 7% (early), 10% (clean), 6% (late) A shoulder tackle with a white aura around Dark Samus. Deals more damage and knockback near the middle of the attack, KOing opponents at around 150% from the center of Final Destination, and earlier near edges. However, the early and late hits are noticeably weaker, and the move lacks combo potential. 13% (Arm Cannon), 15% (blast) Quickly thrusts her Arm Cannon forward to fire a small, electric blast. Functions similarly to Mario's forward smash, with the blast being the most powerful part of the move. It is one of the fastest forward smashes in the game, coming out on frame 10, while the blast has enough knockback to KO at around 100% from center stage. However, it is rather weak otherwise, with the Arm Cannon KOing at around 135%. It can be angled like her forward tilt, with the upward angle dealing more damage and knockback, though it can typically miss as a result; conversely, the downward angle can hit ledge hanging opponents, but deals slightly less damage and knockback. Compared to Samus' version of the move, it has slightly less range. 3% (hits 1-4), 6% (hit 5) Fires five electric blasts in an overhead arcing motion. This move works best as an anti-air attack, as its multiple hits give a good amount of aerial protection. Conversely, it is unable to hit grounded opponents unless they are close enough to Dark Samus. Compared to Samus's version of the move, however, Dark Samus can catch opponents at a lower height. It is also her most damaging smash attack, dealing 18% total uncharged. However, due to its hits being spread above Dark Samus, it can fail to fully connect if the opponent is hit from too far. 10% (front), 12% (back) A legsweep. A semi-spike with decent speed and high base knockback, allowing it to set up edgeguards and punish rolls effectively. However, it is relatively weak from center stage, with the front hit not KOing until around 200%. 10% (hit 1), 9% (hit 2, clean), 8% (hit 2, late) A spinning roundhouse kick. Hits on both sides quickly and can autocancel with a short hopped fast fall. Its first hit also deals powerful knockback, which makes it a viable KOing option offstage or near the edge, as well as a decent combo finisher. 3% (hit 1), 1.6% (hits 2-4), 5% (hit 5) Fires five electric blasts in a slow, downward arcing motion. The first four hits drag opponents into the rest of the move using the autolink angle, with the last hit carrying the entire attack's knockback. Dark Samus' main aerial move for both combos and protection. Extremely useful as an edge get-up option or against air dodges due to its multiple hits, and using the move immediately after a short hop can hit opponents with the last hit before Dark Samus lands again. 14% (clean foot), 12% (clean leg), 9% (late) A back kick. It is fast and deals powerful knockback when sweetspotted, which makes it an excellent KOing option, especially when edgeguarding. When sweetspotted, it is among the strongest back aerials in the game, KOing at around 110% from center stage. 3% (hit 1), 1.3% (hits 2-5), 4% (hit 5) A diagonal corkscrew flying kick, hitting multiple times. It is her fastest aerial, due to coming out on frame 5. Grounded opponents can be hit by the last hitbox if Dark Samus lands while starting the move in the air, although it is difficult to do so, and risky due to the move's high landing lag. It can be used as a follow-up after a dash attack, grounded up tilt, down aerial, or down throw, all of which can be followed up with another up aerial and/or can be finished off with a Screw Attack. On stages with platforms, it even has potential for a zero-to-death when using a platform to extend the combo. 10% (early, late), 14% (clean) Swings her Arm Cannon in a downward arcing motion. Hitting with the move's trail meteor smashes opponents, while the edges of the move at the very start and end deal decent horizontal knockback. Autocancels from a short hop, and due to its relatively low ending lag, the meteor smash is excellent for starting combos on grounded opponents, much like her up tilt. Grapple Beam 1.5% (hit 1), 3% (hit 2) Fires the Grapple Beam. A useful spacing option due to having only 8 frames of landing lag. It autocancels from a full hop and has impressive range, being the longest grab aerial in game. In addition to its recovery and spacing capabilities, it is good at setting up combos at close range upon landing, due to its low landing lag. Unlike in previous games, however, hitting an opponents causes the Grapple Beam to retract earlier, while not reducing the move's ending lag. Grapple Beam — Fires the Grapple Beam. It has impressive range and is tied with Samus's grab as the longest tether grab in the game. However, it is one of the slowest grabs in terms of ending lag, making it very punishable if missed. 1.3% A palm strike. Has moderate damage and speed relative to other pummels. 10% Twirls the opponent overhead, then flings them forward. Although its knockback has been increased, it remains too weak for KOing at realistic percents, unless Dark Samus has rage and is at the edge of the stage. 10% Swings the opponent behind herself. Slightly more effective for KOing and setting up edgeguards than her forward throw, due to its lower launch angle. 5% (hit 1), 7% (throw) Puts the opponent above herself and blasts them upward with her Arm Cannon. Dark Samus's most damaging and strongest throw, possessing enough knockback to KO middleweights under 190% from ground level and without rage. At low percents, it can also combo into an up aerial against large characters, as well as Screw Attack against most characters, though the latter will only connect its hits reliably on a few characters. 8% Swings the opponent high above her head, then slams them onto the ground. A reliable combo starter, with its followups including a dash attack or dashing up smash at low percents, a neutral, back or up aerial up to mid percents, and a forward aerial up to high percents. Charge Shot 5% (uncharged), 28% (fully charged) Charges a ball of energy and fires it. Boasts excellent KO potential when fully charged, and is a useful intercepting move at a low charge. KOs at 70%-110% depending on rage and the opponent's weight and DI. Can be used to break shields if used in conjunction with her neutral attack, up or down tilts, aerials, Bomb and Super Missile. When using her forward tilt to launch the opponent into tumbling, it can set up a guaranteed combo into Charge Shot regardless of the opponent's tech option, as Charge Shot will always catch their tech direction. Missile 8% (Homing), 12% (Super) Fires a Missile, which homes in on the opponent. If the special button is tapped like a smash attack, Dark Samus will instead fire a Super Missile, which stays in place for a short while before traveling in a straight line, and deals more damage and knockback. Both variations deal low knockback, but can be used to break a shield if used in conjunction with a fully charged Charge Shot. Both Missile variations can also be used as set-ups by opening up an opportunity for a grab aerial, or Charge Shot, while the Super variation sets up better for a true combo into a forward jumping Charge Shot at high percentages. The Homing variation is also useful for catching recoveries and forcing air dodges, which can open up punishment opportunities. Screw Attack 3% (grounded hit 1), 1% (grounded hits 2-8), 2% (grounded hit 9), 1% (aerial hits 1-12) Leaps upward to perform a high-speed somersault while discharging energy. Shoots upward if initiated from the ground, while it gains distance slower if started in the air. A useful out of shield option, due to coming out on frame 4 on the ground, and deals good knockback that can KO around 100% while near the upper blast line. Bomb 4% (contact), 5% (explosion) Rolls into a Morph Ball and drops a Bomb, which explodes after a set time. Useful to force an opponent to shield and for edgeguarding, being capable of 2 frame punishes if timed correctly. It can also break shields depending on their health if used along with her up and down tilts or a fully charged Charge Shot. Phazon Laser 0.5% (fringe loop), 1.5% (main loop), 2.5% (fringe blast), 5.5% (main blast) Fires a very large, bluish white energy beam. The beam can be angled vertically during the Final Smash. Warps onto the stage from a dark portal. Up taunt: Hovers up slightly while glowing with Phazon. Side taunt: Spins around while glowing with Phazon. Down taunt: Crouches down while holding her arm cannon upright. Slightly resembles Samus's taunt in Melee. Raises her arm and lowers it in a fist bump pose, albeit with her fingers not fully enclosed to make a fist. Based off of her birth in the 100% ending of Metroid Prime. Splits from a Dark Echo with an acrobatic cartwheel. They then levitate in a circle around an axis before recombining together. Dark Samus then poses with her free hand on her Arm Cannon, which is pointed upward. Resembles Samus's own pose in Ultimate. Turns toward the camera while glowing with Phazon, then the camera dramatically zooms in, showing two of her eyes glowing through her visor. Resembles the SA-X's introduction in Metroid Fusion. An intense and sinister variation of the Metroid victory theme. Dark Samus faces off against protagonist characters while she is teamed up with dark/evil/corrupted variants of characters from their series, except for the penultimate battle, which is a free-for-all against Samus and Ridley. 1 Link Hyrule Castle Hyrule Castle (Outside) Zelda in her black costume is a CPU ally. 2 Chrom and Lucina Arena Ferox Power-Hungry Fool Robin in his white costume is a CPU ally. 3 Ryu Suzaku Castle M. Bison Stage Type B Ken in his black costume is a CPU ally. 4 Squirtle, Charizard, and Pikachu Saffron City Battle! (Team Galactic) Ivysaur in its green costume is a CPU ally. 5 Mario, Peach, and Daisy Princess Peach's Castle Main Theme - Luigi's Mansion (Brawl) Luigi in his purple costume is a CPU ally. 6 Samus and Ridley Norfair Vs. Ridley (Brawl) This battle is a free-for-all. Dark Samus is absent from the World of Light opening cutscene, though she was vaporized and placed under Galeem's imprisonment alongside the rest of the playable fighters (excluding Kirby) when Galeem unleashed his beams of light. Dark Samus was one of the many fighters that fell under Dharkon's control upon Galeem's first defeat, and is found in The Final Battle as one of the last fighters under his command. She is one of the few obligatory unlocks, and defeating her leads to a fight with Crazy Hand and the subsequent reveal of Palutena's location. Dark Samus's Fighter Spirit can be obtained by completing Classic Mode. It is also available periodically for purchase in the shop for 500 coins. Unlocking Dark Samus in World of Light allows the player to preview the first spirit below in the Spirit List under the name "???". As a Fighter Spirit, it cannot be used in Spirit Battles and is purely aesthetic. Each Fighter Spirit has an alternate version that replaces them with their artwork in Ultimate. Charging a forward smash on the Great Plateau Tower. Dark Samus with a fully charged Charge Shot on Great Bay. Dark Samus using her grab aerial on Palutena's Temple. Dark Samus using her forward aerial on Dark Pit on Gerudo Valley. Dark Samus standing beside Lunala on Spirit Train. Dark Samus's purple costume on Lylat Cruise. Dark Samus and Chrom on Skyloft. Dark Samus kneeling next to her Bomb on Bridge of Eldin. Dark Samus, alongside Little Mac and Isabelle, is one of the three playable characters who initially appeared as Assist Trophies in previous installments prior to becoming playable. Out of these, she is the only one to be an Echo Fighter. Dark Samus is the second character to be cloned from a female (in this case, Samus), with Daisy being the first. Much like Daisy's base fighter, Peach, having had Daisy-based alternate costumes in all of her previous appearances, Dark Samus's base fighter, Samus, had a Dark Samus-based color scheme in Smash 4. This color was removed in Ultimate, likely to make it easier to distinguish Samus and Dark Samus. Dark Samus, following Diddy Kong, is the second non-Japanese character to be playable in Smash Bros., and she is the first character in the series that was created by an American developer, Retro Studios. Dark Samus is the second playable female villain, the first being Wendy. However, Dark Samus is the first female villain to have a dedicated slot on the character select screen due to Wendy being an alternate costume for Bowser Jr. 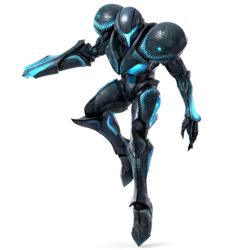 Originally on the Super Smash Blog, Dark Samus was referred to with neuter pronouns, despite being referred to as a female in scan data in the Metroid Prime games and in previous Smash Bros. trophies. This choice may have been due to her being composed entirely of a mutagenic substance known as Phazon, and her original form, Metroid Prime, was referred to with neuter pronouns before absorbing Samus's Phazon Suit and becoming Dark Samus. This error on the blog was later corrected. Dark Samus's Final Smash resembles Samus's fully charged Phazon Beam while in the Hyper Mode of her PED Suit in Metroid Prime 3: Corruption. Just like fellow Metroid newcomer Ridley, Super Smash Bros. Ultimate marks Dark Samus's first playable appearance. Dark Samus also marks the first time the Metroid series has a playable Metroid. According to Sakurai's weekly Famitsu column, Dark Samus was added due to her popularity overseas, while Chrom was added due to his popularity in Japan. Dark Samus is the only Echo Fighter who is a villain, as the rest of the Echo Fighters are either heroes or, in Dark Pit's case, an anti-hero. While Dark Samus normally has a different idle stance from Samus, she will assume Samus's idle stance briefly if killed by a low-damaging attack in Stamina Mode. All of Dark Samus' Arm Cannon-based moves (except for down tilt, up smash and forward aerial) alter the Arm Cannon to match the color of her "visor" and armor highlights. Dark Samus's Classic Mode pairs her up with corrupted versions of fighters to fight the heroes of the respective series. The pairing choices reference a time where the fighter was possessed or brainwashed into fighting the protagonist. Zelda fought against Link when she was possessed by Ganondorf and Malladus in The Legend of Zelda: Twilight Princess and The Legend of Zelda: Spirit Tracks, respectively. The future Robin was possessed by Grima and fought Chrom and Lucina in Fire Emblem Awakening. Ken was brainwashed by M. Bison and became Violent Ken in SNK vs. Capcom: SVC Chaos and Ultra Street Fighter II: The Final Challengers. Ivysaur is the only one that was not corrupted in its game. It was likely paired with Dark Samus because it is a Poison-type Pokémon or a reference to the Dark Ivysaur card from the Pokémon Trading Card Game. Luigi was brainwashed by Nastasia and became Mr. L in Super Paper Mario (though his costume here is based on his rival, Waluigi). Dark Samus still runs when carrying heavy items such as a crate. This page was last edited on April 21, 2019, at 09:31.